Internet Resource of the Month. New releasae of learning-center software. MS Word Tip of the Month. Welcome to the December issue. Do you believe 2001 is almost over! Appropriately, this issue features an end-of-semester recommendation from Frank Christ. If you need to hire SI leaders for the next semester, Barbara Stout and Jeanne Wiatr give you some excellent tips in their Supplemental Instruction article. Interested in more info on SQ3R? Check out Susan Palau's web site review. As a special treat this month, Dennis H. Congos and David W. Bain share with us their research in the area of learning mathematics coursework using writing. The articles in this newsletter are brought to you by dedicated learning centers professionals who take the time out from their busy schedules to share their knowledge and experience with you. Show them your appreciation by dropping them a note and tell them how their contributions are helping you. You will find the email address of each contributor at the top of his column. Do you have something to share with your colleagues? We are happy to publish your article on issues related to learning centers. This newsletter has over 500 subscribers in learning centers and is an excellent medium to share your knowledge and expertise with your colleagues. Since we have subscribers from all over the US, you can even say that your article was featured in a national publication. See the submission guidelines by clicking here. Enjoy the new issue, and don't forget to share it with your colleagues. Next month, January, marks the beginning of the Spring semester. Here are some management ideas to consider as you end the Fall semester and before you begin the Spring semester. Review your annual goals and objectives document to determine which of your Fall goals and objectives you have achieved and which you have not. Schedule a half-day staff retreat to review your findings. If you are not using some type of Management by Objectives system and are interested in knowing more about it, read Using MBO to Create, Develop, Improve, and Sustain Learning Assistance Programs. It just might increase your center's accountability, program visibility, and campus recognition. Based on what you have learned about your center's performance in the past semester, plan your management activities for the coming semester. When planning management objectives, remember to identify tasks, a completion date, budget, materials, and personnel, and a staff member responsible to reach the stated objective. Make a time available at spring semester staff meetings for program review so you can immediately remedy any problems as they occur. Insure that you involve your entire staff in these activities. As you identify past semester problems, consider what assistance is available to you to minimize or eliminate these problems in the future. Remember that everyone at your institution -- an institution that employs many talented faculty and administrators -- is a potential consultant accessible and free. Keep a record of your retreat activities and discussions with an emphasis on "next steps." The Socratic adage about the "unexamined life" is also applicable to management. The unexamined mission, goals, and objectives of a learning support center are not worth writing -- if not lived. Those students you select to provide Supplemental Instruction to your campus are also representatives of your learning center and therefore need to be selected with care. The screening process is worth carefully developing as selection of strong candidates will only make training more focused. Some view the training process as their chance to evaluate the qualifications of individuals for SI leadership. We viewed training as too critical to our quality control to impose the burden of screening candidates. Our intention was to train only the strongest candidates making it easier to recognize any weaknesses potential leaders might have in the field. Although candidates might look good on paper and as a result of recommendations, there is much to be discovered about the students as you train them to provide SI and represent your program. We always depended on recommendations of our faculty to identify good potential applicants. In addition to that resource, we also followed-up on the self-referrals taken from the student surveys conducted at the end of each term and from recommendations of our leaders who identified strong possibilities from their SI session groups. This pool of applicants was a great place to start the selection process. Originally we used the application outlined in the SI Supervisor manual and gradually adapted it to suit our needs as we developed our screening process. We found that many students choose to apply online once that was developed. The application asked for the standard job information, contactable references and a couple of narrative questions that gave some insight to the applicant as well as a writing sample. References were contacted and interviewed as to their relationship with the applicant and impressions of how the student would work with faculty and peers according to the SI model. If we felt the applicant was one we wanted to pursue, after checking references, we invited them in for an interview. In our situation there were two supervisors and we used this to our advantage. One supervisor started the process by reviewing the SI model with the applicant. The other supervisor posed thought provoking questions looking for insights to the study process, attitude toward struggling students, and reflections about the SI model. Students were also asked about their contact with SI in their classes. Although there is an advantage to having multiple interviewers one person could develop layers of the interview process to create a similar effect. If an applicant passed through this scrutiny we generally approved them as candidates for SI training. Qualities we looked for in filling these leadership positions included much more than a grade point average and a good "rap" from a friendly professor. There were instances where an "A" student with great recommendations from the professor concerning content competency were turned down because the interview process revealed that they simply didn't have the people skills necessary to work with a broad range of students. On the other hand, we accepted applicants who were "B" students. They often had a greater insight to the struggle that was necessary to do well in a difficult class. In order to facilitate a good SI session it is important to be able to help people work for their grade. We wanted leaders that understood that the process of learning was as important as the final grade. The ability to reach people was as critical as understanding material to be mastered in an SI session. Appreciating the challenge a course might pose for some is something that can't be taught, but can be assessed in a good screening process. As we processed candidates for training it was clear the more attention paid to selecting a good match to the SI model the more successful the training experience. Front loading the effort resulted in fewer wash-outs from the training program. Strong candidates allowed training to focus on the meat of the model and enrich the experience for the students. Recruiting the right people allowed for the greatest benefit of training. This holds true whether you run an intensive two-day orientation or have students complete a credited course. The development of a successful interview process will greatly enhance an institutions SI program. 1. Survey - briefly skim over the main features of the chapter, i.e., headings, subheadings, graphic aids, end of chapter summaries and questions. 2. Question - turn each heading and subheading into a 5W type question - who, what, where, when, why, (how). 3. Read from heading to heading, one section at a time. After the first reading, you should take notes, highlight or underline the text or make margin summaries. 4. Recite, without referring to the text, the main facts from the selection you just read. Check your memory. If you are satisfied that you recall what you have just read, go to the next heading or subheading and repeat Steps 2 to 4. If you did not remember the major details, re-do Steps 2-4 on the same section. Do Steps 2-4 until you finish the chapter. 5. Review - the information leaned in the chapter . Look at the heading questions and see if you can remember the main points. Do this daily for a few minutes each day. The College of Saint Benedict/Saint John's University website can be found at www.csbsju.edu. Once you have entered the home page, it may be best to use "Search" to find the SQ3R method instructions. Otherwise, go to "Academic Advising" and you will find a list of 19 links covering most of the other study areas. What was a little unusual here was that 3 of the links bring you to Dartmouth University, The University of California, Berkeley, and Virgin Tech study skill sites. I was disappointed that I got an error message when trying to visit Berkeley, however. The article in which I found this web site is entitled, "How to Create and Use PowerPoint Presentations to Teach Reading Skills", by JoAnn Yaworski. It details a smashing lesson for using PowerPoint to teach the SQ3R study method in a multi-sensory way. Reading this article in conjunction with visiting the website is a good use of your time. Well-written and well-organized board work for teaching solutions to various math problems is very helpful to learners trying to understand how to solve math problems. This article presents a model for teaching math that illustrates the value of using writing within a step-by-step approach to help students understand and learn math solutions. The model also includes a method for presenting quantitative course content that accommodates the strengths of learners with primary verbal learning abilities as well as those with primary quantitative learning abilities. The decline in the state of mathematics education in the U. S. compared to other nations was documented by McKnight and others in 1987 (McKnight and others, 1987). The National Research Council expressed its concern in 1989 with a call to improve the ways children learn math (1989). As a suggestion for better math education, Garfolo proposed creating an atmosphere where the math classroom must focus on making sense and creating meaningful understanding when students attempt to understand and learn how to solve math problems. (Garfolo, 1994). The National Council of Teacher’s of Mathematics in their standards for school math emphasizes the need for using oral and writing skills to clarify thinking and understanding about math ideas and relationships (1987). Many math instructors are not aware of the fact that there are learners with primary verbal learning abilities as well as primary quantitative learning abilities. Because of habit, training, or assumptions about learning many math instructors typically teach to the learner with primary quantitative abilities. It is normal for verbal learners to have difficulty understanding and assimilating material presented in quantitative language (numbers, letters, and symbols) just as quantitative learners find verbal courses (psychology, history, sociology) more challenging. To speed the learning of math, there are many benefits to including writing to promote the understanding of solutions to math problems especially for learners with well-developed verbal learning abilities. Writing in math is directly related to solving math problems (National Council of Teachers of Mathematics, 1989). It encourages clearer thinking of mathematical ideas and processes, and more quickly reveals the level of understanding among learners (Miller, 1991). The model below presents a simple format for organizing math lecture and textbook material that includes the beneficial element of writing. This model speeds learning, facilitates identification of incomplete or incorrect understandings in solutions, and signals when and where help is needed before a test is taken when something can still be done about it. Presented below are the steps for implementing this board work model. This model allows for presenting and formatting math problems and solutions so that both quantitative and verbal learners can use their strengths whether it lies in quantitative or verbal abilities to understand and learn mathematics. Step 1: Divide the chalkboard into 4 equal sections. Step 2: In section 1, write down relevant prerequisites for solving this type of problem. Step 3: In section 3, using short phrases, write the words for what is done in each step from section 2. This narration becomes the rules for solving this type of math problem in the future. When finished, ask for questions and be ready to explain what is done and why for each step in the solution. This promotes understanding and is especially useful to learners with marginally developed quantitative abilities and well-developed verbal learning abilities. Allow learners to ask questions to increase or to check understanding. The written rules can then be used for solving other similar problems. For example, when a learner knows the rules for multiplying fraction problems, s/he is able to solve an unlimited number of problems of this type. Step 4: In section 4, when there are no more questions, record a similar problem for learners to practice and to check for understanding. If they get stuck, they are now armed with prerequisites, a model of a solution, written rules for a solution, and the knowledge of instructors, tutors, SI leaders, and/or collaborating peers. When learners finish the practice problem, the instructor, tutor, SI leader or another learner writes each step of a solution on the board as it is dictated or a learner may come to the board to present a solution, step-by-step. The person offering a solution should explain: (1) what is done in each step, (2) why it is done that way and (3) how to verify that they have the right answer. AccuTrack is specialized database software designed for learning centers. The software has many uses, including attendance tracking, appointment scheduling, demographics reporting, traffic analysis, feedback collection, tracking loaned materials, and more. Version 6.2 of AccuTrack was just released. This version allows you to query demographics data. For example, you can find out how many visitors you had during a certain time period that were freshmen from the college of business and not out of state. Of course the actual queries depends on your demographics questions, which you can setup yourself. Version 6.2 is now shipping to all new customers. This version is offered as a complementary upgrade to all AccuTrack 6.0 customers . In fact, we have been providing our AccuTrack 6.0 customers with complementary upgrades this whole year. If you are not yet an AccuTrack user, this is a great time to check it out. Act now and you could have the software up and running at your center by the beginning of the Spring semester. Get AccuTrack and make this semester the last one where you have to do extensive manual data tabulations to figure out the usage statistics for your grants. This conference will explore how technology can be used to effectively assist low-income and underserved students preparing for postsecondary opportunities. For further information or questions, please contact Carmen Torres at 973-484-7554 or ctorres@nj.aspira.org. Each year the National Association for Developmental Education (NADE) offers a national conference that attracts over 1,400 educators from across the U.S. In addition to nationally-known plenary speakers, nearly 200 concurrent sessions provide a comprehensive treatment of developmental education issues. Visit http://www.neoaonline.org to learn more about the New England Educational Opportunity Association (NEOA)..
Windows XP, should you upgrade? In October the long awaited and highly hyped Windows XP was launched. This was the first time I was eagerly waiting for the release of a Windows product. I had read many positive reviews about the latest OS from Microsoft, and also wanted to get rid of my ailing Windows ME system. But first some background. About a year ago I upgraded my computer from Windows 98 to ME (Millennium Edition). That turned out to be a mistake. ME seemed to be something Microsoft (MS) came up with only to generate more sales. Before making the upgrade I read that ME was "Windows 98 + all the fix packs". Unfortunately I found out later that it would be more accurate to add to that "minus many advanced features". ME seems to have been created for the novice user as it didn't provide much control over its environment. In addition, ME was not very stable and locks ups were a daily event. One solution to the ME problem was Windows 2000. As you might know, 2000 was the successor to Windows NT, a decent operating system known for its stability and maturity. MS marketed Windows NT / 2000 as the "business" operating system, while Windows 95/98/ME were marketed as the "home user" operating systems. Since my home user option sucked, my next option was Windows 2000. However, 2000 did not support as many hardware options as 98 did and was a relatively expensive upgrade ($200 vs $90 for ME). With Windows XP, Microsoft is now using the same engine for its home and business markets. XP is based on the Windows NT / 2000 engine, so it inherits 2000 stability and maturity, and some Windows 98 wide hardware compatibility. Add to this a slew of new features, and you have one great operating system at the bargain upgrade price of only $99 for the home edition. MS also offers another more expensive flavor of XP called the "Pro" version, but this has "advanced" features that I doubt any average user will need. So what do I like about XP? You are working hard on your Word document, and suddenly it happens: you have a power failure or Windows freezes, and your document is gone! What do you do know? First to preserve sanity, get into the habit of saving your work every few minutes. This way if you run into the above situation, the most you will lose is a few minutes worth of work. In some cases Word will detect the outage and will load a saved copy of the document for you. However, this copy will have a different name from what you were using, so it is important that you save it under a different name before you close it. Make sure that this copy is is up-to-date, and if it is newer than your last saved copy of the document, use it instead of the other one. 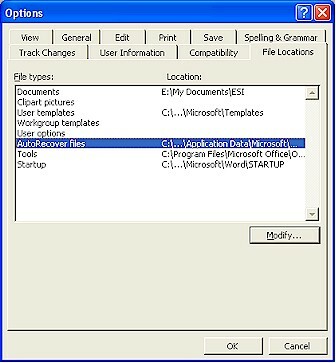 In Word, click on "Tools" then "Options"
Click on the "File Locations" tab. Look for the "AutoRecover" line and read the path. If the path is too long click on it then click on "Modify" to see the whole path. Make sure you don't actually change this path while doing this. Launch Windows Explorer and browse to the AutoRecover path you got above. In explorer click on "View" then "Details", and click on the "Date Modified" header to sort files chronologically. Look at the latest file in this folder and check its last modified date and time. There is a good chance this is the file you need to recover. Simply double click on it to load it in Word. Check the file, and if it is what you want, save it under a different name. I failed every subject except for algebra. How did you keep from failing that? Yes, I'm no good at math! Dad, can you help me find the lowest common denominator in this problem please? Don't tell me that they haven't found it yet, I remember looking for it when I was a boy! Did you parents help you with these homework problems? No I got them all wrong by myself! I can't solve this problem. Any five year old should be able to solve this one. No wonder I can't do it then, I'm nearly ten! If 1+1=2 and 2+2=4, what is 4+4? That's not fair you answer the easy ones and leave us with the hard one! Up and down or across? Well, up and down makes a 3 or across the middle leaves a 0. Now class, whatever I ask, I want you to all answer at once. How much is six plus 4 ? If there are ten cats in a boat and one jumps out, how many are left ? None, they were all copycats! "You cannot teach a man anything; you can only help him find it within himself." "Education: Being able to differentiate between what you do know and what you don't. It's knowing where to go to find out what you need to know; and it's knowing how to use the information once you get it." "Intellectual growth should commence at birth and cease only at death." "Training is everything. The peach was once a bitter almond; cauliflower is nothing but cabbage with a college education." "Our progress as a nation can be no swifter than our progress in education." "Education is a social process...Education is growth...Education is, not a preparation for life; Education is life itself." "Knowledge is the only instrument of production that is not subject to diminishing returns. " "Our greatest natural resource is the minds of our children." ". . . whenever in all his history Man has asked the right question, he has found the answer." A management tip by Frank Christ on the "LAC War Room". A review of a speed reading web site by Susan Marcus Palau. Training SI leaders by Jeanne Wiatr and Barbara Stout. Online graduate course for learning support center personnel. Powerful Windows NotePad replacement software..
To view the November issue, click here. Submitting articles of interest to learning-assistance professionals. Reviewing books and other learning-assistance resources. Informing us about conferences and other happenings. Nominating your favorite learning center professional for the Person of the Month column. Sharing resource information with your peers: web sites, publications, etc. The average article length is one page written in 12 points size and single line spacing. If the article is long, we might put it in a separate page and show the first few paragraphs in the newsletter with a link to the full article. Send your articles in ASCII text or MS Word format. We will take care of the html conversion. If you want to include images with the article, the preferred format is jpg or gif, but we will convert images in other formats if needed. The newsletter is usually released during the first week of each month. The deadline for each issue is the 27th of the previous month, so if you would like to submit an article for the next issue, we need to receive it by the 27th of this month. By submitting articles, you give us the right to publish and edit them if needed. The subject of submitted articles must be related to learning centers. The editor of this newsletter reserves the right to reject articles at his discretion. We certainly hope you find this newsletter useful and entertaining. We welcome your suggestions and improvements ideas. To send in your comments, simply click here. This newsletter is sponsored by AccuTrack and edited by Mon Nasser from Engineerica Systems, Inc. My thanks to this month's contributors: Frank Christ, Susan Marcus Palau, Barbara Stout, Jeanne Wiatr, Dennis Congos and David Bain. Note that the process of tracking members and emailing them is currently handled by humans. If there is an error in your subscription, please email us. Copyright © 1999 -2004 Engineerica Systems, Inc.
Email webmaster@LearningAssistance.com if you have any questions or comments.